Crusty, flavorful and golden-crusted, this sesame seed bread brings an old world bakery flair when it accompanies your sandwiches and soups. What could possibly be better? 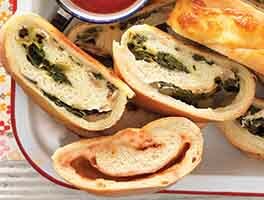 To make the starter: Combine all of the starter ingredients, mixing just until a cohesive dough forms. Allow it to rest, covered, for 12 to 16 hours at room temperature. When the starter is ready, it will be filled with large holes and bubbles. To make the dough: Add the water to the starter, and mix until smooth. 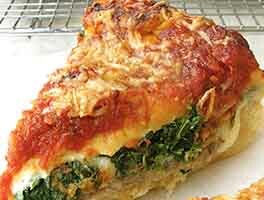 Place the dough in a lightly greased bowl, cover, and allow the dough to rise at room temperature for 1 1/2 hours. To help develop the gluten and distribute the yeast's food, turn the dough twice during the rising time: gently fold all four sides into the middle, and turn the dough over. Divide the dough in thirds, and roll each third into a 20"-long rope. Braid the ropes. Set the braid on a lightly greased or parchment-lined baking sheet, cover with greased plastic wrap and let rise 1 to 1 1/2 hours, until just puffy. To bake the bread: Preheat oven to 425°F. Gently brush the braid with the beaten egg white mixture and sprinkle generously with sesame seeds. Bake at 425°F for 25 to 35 minutes or until the loaf is golden and feels lighter when picked up. Remove the braid from the oven and cool on a rack. Store on the counter, well-wrapped, for 3 days, or freeze for up to 3 months. I baked this bread this weekend. I am an amateur bread baker and it turned out great! I loved the nuttiness of the sesame seeds on top. Plus, the braiding made it look extra impressive. I'll be having this with dinner tonight with some whipped honey butter. :) One question: I found the dough ropes for the braid hard to roll out and shape. They kept "springing back" to their original shape despite my best efforts. Did I over-knead the dough or not let it rise enough? I let it rise a little over 1.5 hours on the first rise. 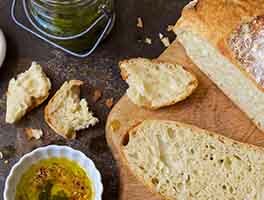 I have baked many breads and this one is delicious and fast and easy to make. I have made braided breads too, they come out beautifully defined in the braided shape--so much so that that I have photographed them bc they look so professional. However, I found the length of this braid (20"), way too long to wrestle with. I don't make my dough dry, purposely, bc more flour tends to make dry bread. (I used the 241grams, 2 cups, to the final step of mixing). But with this one, I suggest not being afraid to add some more flour so as to braid the 3 ropes of dough easier and making a more definitive braid shape when it bakes. For sure, I would not make this braid longer than 15." At 20" long, it doesn't even fit on a large cookie sheet unless you put it on a diagonal, and even at that, it falls short. Perhaps making two 10" loaves would work better instead. In summary, bread tastes good and is light and crunchy, but the braiding lacked a definitive shape due to the length and partly bc of my preference to not put excess flour in my bread doughs. I added some 'everything bagel seeds' to the sesame seed topping to give it a saltier bite. I will try this bread again bc it is so easy, with the changes noted. Hope the next time I will have gotten it perfect. Wow, is this great bread! And it couldn't be easier. If you leave the sesame seeds off the top, it's a very close match to Heidi's Brooklyn Deli "ciabatta bread." Great with egg salad! 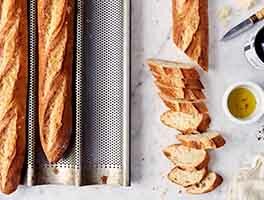 One of my go-to bread recipes when I need a loaf that goes with everything I roll the plats in sesame so they are loaded....even a nuttier flavor. 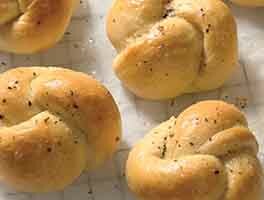 Also translates to delicious braided rolls! 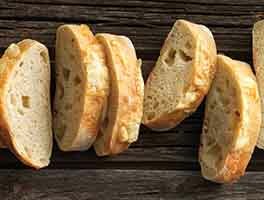 This is bread recipe is very similar to the Star bread you can get in the Italain bakeries in Springfield, Mass. The only difference is that they use live Brewers yeast, and lard. In my opinion this recipe works just as well. I gave this a 5 star because I make this bread 3 days aa week but today with it being 100 deg. Outside with high humidity the dough was very sticky even after adding another whole cup of flour than what the recipe called for. It rose beautifully then deflated to a pile of mush when I inverted it onto the counter to roll into strips to braid. The second rise was beautiful also but deflated after taking greased plastic wrap off of it. I still brushed with egg wash and sesame seeds applied and baked 25 min. Very dense but tastes good. I just don't know what happened. But I do recommend as a great bread. Smells fantastic baking and tastes good. I reviewed this earlier but made a mistake! When subbing your own sourdough starter, the correct amount is between 454-482 grams! I make this every week and it never fails to be delicious.